Doctors and researchers work towards developing new drugs, new procedures to cure, detect, prevent or treat diseases. But the people, families and patients, have put their trust and life by joining the clinical trials needed to determine if these drugs or procedures worked. The combination of both parts, doctors and patients, are crucial to advance medicine. It is common to hear people saying “I am not a guinea pig”, referring to participate in a clinical trial. It can be scary; it is unknown what will be the outcome of it. In Puerto Rico, in the 1950’s, women were subject of the clinical trial for the birth control pill without knowing it was a clinical trial. I believe this, and other examples throughout history, created this sense of distrust for clinical trials among Puerto Ricans. However, we, scientists, have moved past all those unethical activities. We believe in the power people have over the future of medicine. Puerto Rico have very distinctive characteristics that are not comparable to other ethnicities. We need more representation in clinical trials to make sure that we are getting the right treatments and healthcare. For that reason, the Puerto Rico Science, Technology, and Research Trust launched in April 2016 thePuerto Rico Consortium for Clinical Investigation (PRCCI). Their mission is to promote and enhance clinical research and development for the benefit of patients, the Puerto Rican economy, and global scientific innovation. This article aims to present you this initiative and what they have in agenda for the future. For that, we asked a few questions to Dr. Kosmas Kretsos, Executive Director of PRCCI. What is the Puerto Rico Consortium for Clinical Investigation? Dr. Kretsos: Puerto Rico Consortium for Clinical Investigation (PRCCI) is a not-for-profit consortium of clinical research sites across Puerto Rico, aiming to enhance and promote clinical research by centralizing and optimizing clinical study start-up operations, quality, and business development/promotion. The PRCCI members compete as one in the global clinical trials landscape and bring innovative clinical research to the island for the benefit of patients and the Puerto Rican economy as this activity helps retain our highly skilled physicians, nurses, and research staff on the island and not migrate to mainland US or elsewhere. PRCCI’s mission has also an essential educational and patient-centric component, we strive to help train investigators and research staff on best practices for clinical research and also work with patient advocacy groups to empower patients with information exchange and knowledge about clinical research, the benefits, and the risks. Who is part of the consortium? Dr. Kretsos: As of end of July there are 12 members in the consortium a mixture of universities, hospitals, and private research sites. Specifically, in alphabetical order the current members are: Altamira Family Medicine and Research Institute; Fundación de Investigación; GCM Medical Group;Grupo Dermatológico; Grupo Pediátrico de Caguas; Hospitales HIMA San Pablo; INSPIRA Clinical Research; INSPIRA Medical Research; PR Renal Health and Research; Miguel Sosa-Padilla, M.D., Private Practice; Cooperativa de Facultad Medica Sanacoop; UPR Medical Sciences Campus. How is it going so far? What have PRCCI achieved and what are the goals for 2016? Dr. Kretsos: It is still early days, we launched PRCCI on April 12th this year. However, the first signs are very encouraging. 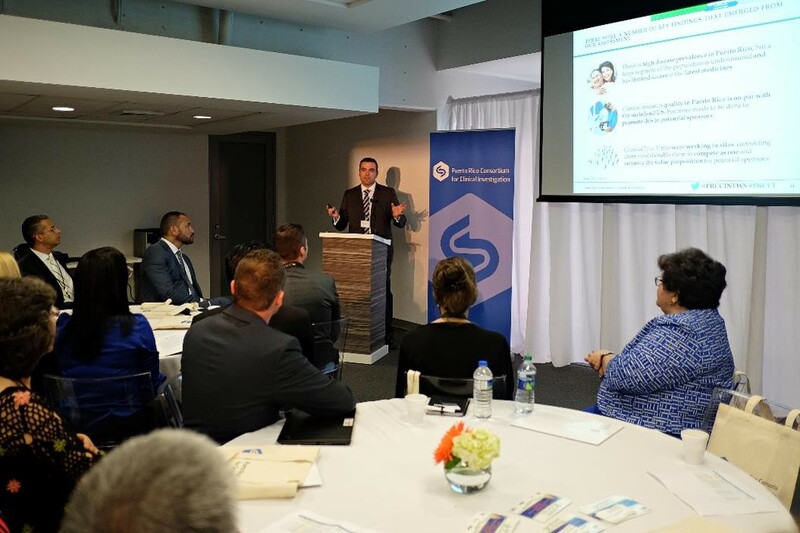 PRCCI is growing rapidly and by showcasing the excellent quality and skills of the Puerto Rican physicians and staff we managed to bring more than 100 clinical research opportunities to the island that our members are pursuing. In fact, there are already 3 ongoing clinical trials and 3 more are about to start very soon. On the training aspect, we partnered with Yale University and co-hosted a workshop on best clinical research practices. We also partnered with pharma companies such as Pfizer, Eli Lilly, and Merck in order to bring to our investigators Good Clinical Practice training. We are working with patient advocacy groups such as APAPP to facilitate meetings with global experts on the latest research findings for their conditions. The overarching goal of 2016 is proving value. Proving the PRCCI value to patients by empowering and informing them. Proving the PRCCI value to our members by working together on better quality and efficiency and by bringing them innovative clinical research. Proving the PRCCI value to the PR society and economy by help retain our skilled workforce and increase revenues from clinical research. Can you provide an overview of the clinical trial history in PR? Dr. Kretsos: I am certainly not an expert on the matter but as a researcher I am aware and appalled by certain clinical trials of questionable ethics and procedures that took place in Puerto Rico in the 1950s. Volunteers that participate in clinical trials are our heroes, taking a risk so that all our loved ones may benefit from better drugs when they get sick. We should protect our heroes the best we can, period. FDA has since implemented rules on informing the patients of the clinical trial risks and benefits but we are all responsible in making sure we treat our patient-heroes right and report immediately any wrong doing. Why is important to include Puerto Ricans in clinical trials? Dr. Kretsos: Because patients may respond differently to treatment / drugs based on their genetic heritage and environmental conditions. Therefore, a drug that is tested only on Caucasians or only in one place may be less effective or less safe to Latinos or African Americans and vice versa. Clinical trials that have adequate representation of different backgrounds give us confidence that when the drug is authorized for general use it will work as it is supposed to for all of us. It is a known fact that Latinos are currently severely underrepresented in clinical trials. 2013 data show that Latinos made up 7.6% of patients enrolling in US based trials even though by 2030 they are expected to be 25% of the general population. Puerto Ricans specifically have a unique genetic signature based on the history of the island, this is partly evident by the different prevalence of diseases such as diabetes and cardiovascular, so, good representation in clinical trials is important. Is there an example of a drug or procedure than went into clinical trials and had a different effect in the Hispanic population? A lot of people have the impression clinical trials are a way of using humans as guinea pigs and are skeptical of joining them. How PRCCI are working with the Puerto Rican population to reduce this idea? Dr. Kretsos: It is our mission to empower patients with information and fact-based knowledge. Once a patient is armed with knowledge she or he can talk to their treating physician make the decision of participating in a specific trial or not. We are fulfilling our mission by working with patient advocacy groups to give access to information. Also, we are scoping a technology investment centered around patients, a platform that will allow patients access to reputable sources of information but also allow them to share their experiences from clinical trials, good or bad, with other patients. Watch this space! What economic benefits have this activity in PR? Dr. Kretsos: The number 1 economic benefit is reducing the brain drain that is happening right now in Puerto Rico. The talented physicians and nurses leave the island in mass to seek employment in mainland US and benefit with their work the economies of Florida, Texas, etc. instead of the Puerto Rican economy. Also, research sites are for the most part small to medium, highly skilled, businesses at the forefront of the knowledge-driven economy that Puerto Rico aspires to. Helping these businesses helps PR being globally competitive and attracts foreign investment in the areas of healthcare and technology. What is next for PRCCI? Dr. Kretsos: Lots of work! We have to keep the great momentum we have achieved and keep proving the value of PRCCI with tangible results. Well, PRCCI is working towards developing a new culture of clinical trials in Puerto Rico. Don’t be scare of the unknown, of the uncertainty. We are all working towards better treatments for Puerto Ricans. Instead of thinking you are going to be a guinea pig, think like Dr. Kretsos said… you are going to be a hero. Let’s thanks all those patients that willingly join a clinical trial, despite the unknown, because they needed a reason to look Forward…to move Forward. About Dr. Kosmas Kretsos: Dr. Kretsos is the Executive Director of the Puerto Rico Consortium for Clinical Investigation, a new non-profit organization in the making that aims to enhance and increase clinical research. Previously, he was a strategy consultant at PriceWaterhouseCoopers in London. His clients included global pharmaceutical and medical devices companies, private equity and venture capital firms, as well as public policy organizations. Prior to PwC, Dr. Kretsos had a core pharma R&D role at UCB where he led design and execution of clinical trials in Europe and USA. He was also part of Entelos Inc., a pioneering Silicon Valley company, testing drug candidates for big pharma clients, via use of virtual patients and simulated clinical trials. Dr. Kretsos holds a Diploma of Chemical Engineering from the University of Thessaloniki, Greece; a PhD in Chemical and Biological Engineering from the SUNY at Buffalo, USA; a MBA from Imperial College at London, UK.